So after being home for a day or two, I left again and headed southward. This time I was with a coworker and her mom. We needed to go through Springfield and the others hadn’t been there before, so we made a couple stops. Our first stop was at The Feed Store – for lunch, a quirky sandwich shop across from the Old State Capitol where Lincoln served. (You can see the reflection of the capitol in the window.) And no, I don’t mean he served lunch at The Feed Store, but as a lawyer in the capitol. 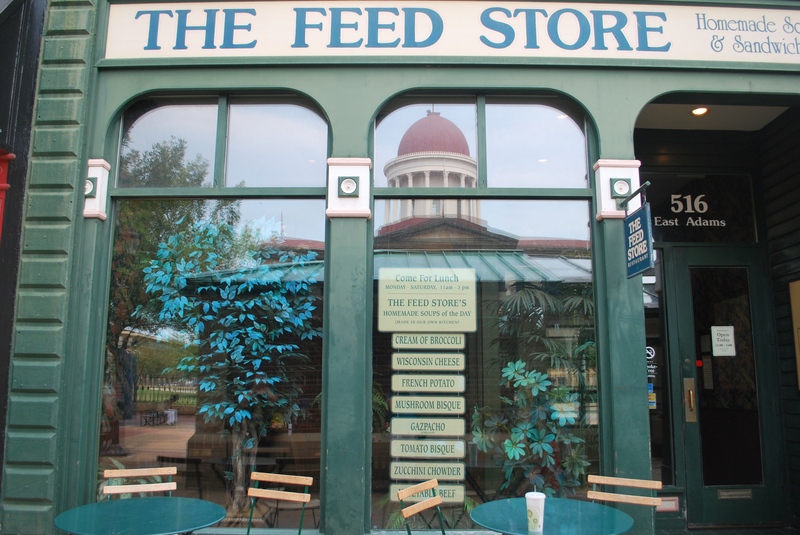 The Feed Store specializes in soup and sandwiches which are popular in the area. However, the quirkiness comes from the whole ordering/serving system. You stand in line and look at the menu. At the beginning of the line, a lady took our order and gave us a number and we found a seat. A friendly server then brought our food to us. Seemed like they complicate a simple process … and then the bill doesn’t have your total. So, you need to go to the cash register for them to add it up. Another added step. But overall a fun stop.